What if you traveled thousands of miles to take beautiful photos of all of the gifts you’ve received over the years? And then you wrote a lovely poem to accompany the images? That is what April Pulley Sayre does in her book, Thank You, Earth: A Love Letter to Our Planet (Greenwillow Books, 40 pages). If the earth could read this book, it would feel the love! Well, the earth may not read it, but you can and so can children, her target audience. Sayre is an author and photo illustrator of dozens of books that combine poetry and photographs to entertain and educate children. Turning the pages quickly and focusing on the words alone, you’ll find that this book is the perfect choice when a child asks for “just one more story” before bedtime. But, if you are in a hurry, don’t let little listeners see the pictures because each one can spark questions about the plants, animals, or geographic features captured in the image. And, while you may be blessed with encyclopedic knowledge of flora and fauna, it is a comfort to know that the “what” and “where” answers to those youthful inquiries can be found in the photo reference on the last page. Like any good love letter, this book can increase longing and affection. Depending upon where a child has lived and traveled, some of the pictures will be familiar and others may seem exotic. So, in addition to delaying bedtime, the book could result in lobbying for a hike in the woods or even an extended visit to the beach or the mountains. Long after children have mastered all of the words in the text and can read for themselves, the book continues to offer lessons. 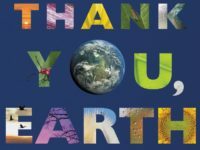 In an author’s note at the end of the book, Sayre presents ways an individual or group can create and share their own thank you notes to the earth. She offers the reader a template for how to take action as well. She encourages her readers to learn about the impacts people have on the earth, communicate those findings with others, and actively participate in doing something to mitigate those impacts. Check next week’s blog post where we will share a Q & A with April Pulley Sayre!